Winter in Kharpert area: how much detail do we have on the use of a ‘kourss’ to keep the family warm in winter? Some of us recall growing up as first-generation American Armenians and being chided by non-Armenians about the very strange habits of ‘the Armenians.’ ‘They’ “wash” their bread [in reality, only dampening with tap water to render pliable a piece or portion of dry flat bread - referred to as chorr hahts, pahts hahts, parag hahts [Endnote 1, at end of paper]; ‘they’ “eat sour milk” [madzoon or yogurt, pronounced yogh’ourrtt by Armenians who spoke Turkish, and has become widely used tho’ often ‘camouflaged’ with fruit] and what is ‘really’ weird is that ‘they’ “take bricks to bed in the winter” to keep warm! The “bricks” referred to were, as some of us will know as kiremits [frequently pronounced kihre’mid by Kharpert villagers  that were usually carefully selected for its composition ̶ that is, the “brick” had to deemed appropriate for heat-conservation and slow-release. They were flat and rectangular in shape and after heating made great bed warmers. Ordinarily, these “bricks” were light clay-colored, and in America at least, they often derived from furnace boiler-liner clay tiles or even chimney tiles. In any case, they were NOT ordinary red-color construction “bricks” that we are generally familiar with nowadays. Their shape and thickness gave ample surface area and made the kiremits warm up fairly quickly in an oven. After neatly wrapping the heated kihre’mid, first in a few layers of newspaper and then placing into a flannel bag or wrapper, they served as an efficient bed- and great foot-warmer for hours on a wintry night. They gradually cooled and were only really cool or spent out by morning — no electric blankets in those days! As an aside, but an important aside, one of us (ELT) remembers his grandmother in small-town Kentucky heating a brick on the radiator, wrapping in flannel and using it the same way as a kiremit. Unfortunately, when compared to other cultures subjected to detailed study by anthropologists and sociologists, there has not been that much written in great detail about Armenian domestic culture insofar as housing for the peasantry or for that matter those better off financially is concerned. So far as we are aware at least, there is not that much more available for those in financially better positions. In fact, we have read missionary accounts that draw attention to the fact that homes of the wealthy could not be differentiated from the outside from those of the relatively poor. Kiremits were used in the Old Country for keeping warm under the yorghan. That is for sure, but the ‘kourss’ was used while sitting about before going to ‘bed.’ Interestingly, the word and concept of the ‘kourss’ seems to be less well known and certainly the kourss is far less frequently encountered in photographs. Availability of some relevant ‘kourss’ photographs has prompted us to share them here. 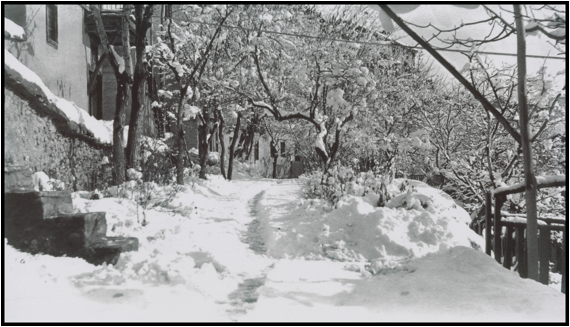 But before we delve a bit into some details of our special topic of ‘the kourss’ it may be well to show some photographs that emphasize that the Kharpert region did get snow, and on occasion the snow amounted to a substantial amount. The color view of Veri Tagh [upper precinct or ward] Harpoot [Kharpert Kaghak] presented in a Post Card below will be fairly familiar to many though this, scanned from an original, is presented in higher resolution than those we have seen elsewhere. The original black and white photograph shown below and from which the colored Post Card was generated will be generally unfamiliar. We cannot claim to know how many of these ‘black and whites’ are ‘out there’ but the ‘original’ or contemporary photograph has to be quite rare. The photograph we show here is not simply the product of converting a color image to a black and white through Photoshop or the like. 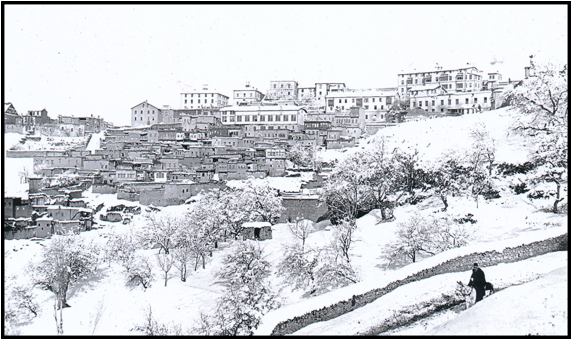 Photograph of Harpoot and the Euphrates College area taken by Ernest W.[ilson] Riggs, President of Euphrates College. Riggs was President of Yeprad College from 1910 to 1915, so the photo would have been given to Louise Carroll Masterson, Consul Masterson’s wife some time before 1914 when the Mastersons left Harput to go to the Consul’s new posting at Durban, South Africa. The photograph shown below shows a winter scene in upper Harpoot city. The photograph was taken near the residential buildings associated with Euphrates College. This photograph comes from a private collection to which we were kindly given access and may be dated as from the winter of 1915 or 1916 or 1917 or 1918. It is noteworthy that it was a dozen years ago or so that we saw a photograph of what was designated as a “course.” And as we shall soon see, it was described rather clearly on the back of the photograph. It was indeed a photograph showing what a ‘kourss’ as described by ADK’s mother looked like. Louise Carroll Masterson’s photograph is shown below and is followed by a scan of the back of the photograph describing the scene. Centralized heating of any sort was not a thing available to the masses, of course, and the kourss is to us a great example of how clever a method this was. Couple this with the body heat of some animals, tucked in on/under a wool-filled yorghan, a kiremit and a prior exposure to the comforting warmth under or beside the “kourss” what more could one want? Necessity is the mother of invention, and no doubt the generally resourceful villagers had things worked out ages ago. We have only encountered a couple of photographic representation of a “kourss”. The one below was published in Rev. 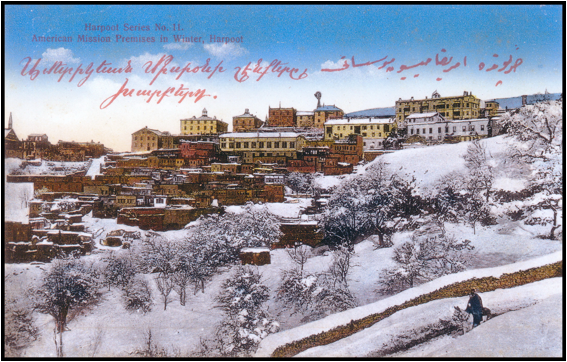 James Wilson Pierce’s “Story of Turkey and Armenia” (1896 pg. 418). The caption reads “KOOR-SE IN ARMENIA.” There is nothing in the text that tells us what a ‘koor-se” is or does. If perchance anyone finds a place in the text that we have missed any mention, however skimpy, of a “koor-se” we should appreciate learning it. .
Another image may be seen in a 1906 book entitled “Mariam, a romance of Persia” by Samuel Graham Wilson (American Tract Society, New York following pg. 30). This is captioned “Abgar and family seated at the kurisee.” On pg. vii there is a glossary of foreign words and there the kurisee is described as “a table over underground oven”. It may be that this photograph is more in keeping with the description given by Villa and Matossian (1982)? But the “course” of Mrs. Masterson and the “kourss” of ADK’s mother seems that it has a bit more potential for better control of heat and might be a hair safer. Some of the medical missionaries commented that children got injured and burned by accidentally coming in contact with the tonir or clay- walled oven in the floor. Last but by no means least, we present below a photo of a “mangal” brought back from Sivas by Near East Relief worker, Mary Hubbard. It shows how elegant mangals could be. A number of years ago we saw a few huge, elegant mangals on exhibit at a museum in Alexandria, Egypt. They were really works of art. When we asked the guide accompanying us whether what we saw in a corner was in fact a mangal, we were told that indeed it was and that the word mangal, used by us, actually derived from the Arabic word manqal. 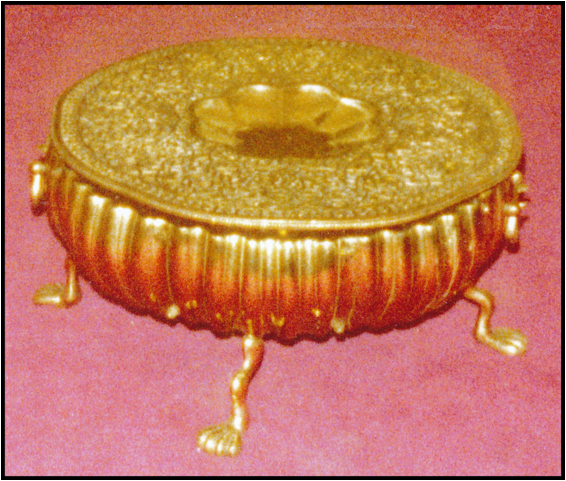 A Mangal from Sivas polished after being brought to America by Mary Hubbard. Specifics on day-to-day life in the Erghir accompanied by great detail are in relatively short supply. Efforts to locate photos, or better yet to locate real items used ought to be a priority. Stories of everyday life might then be told in enough detail so one does not have to allude to generalities that do not stand up to rigorous scrutiny. All would hopefully agree that it would be nice to use imagery that makes sense, and which is based on fact rather than assumptions. Endnote 3: We will hopefully be forgiven for referring to a paper in German by an Armenian. We are sure there are others but this is a really good presentation. 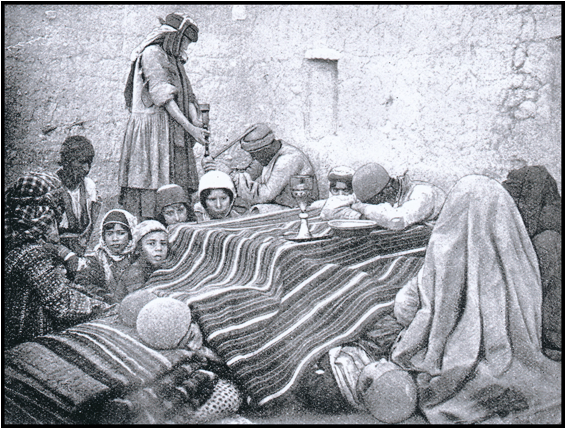 Parsadan Ter Mowsesjanz (1892) “Das armenische Bauernhaus. 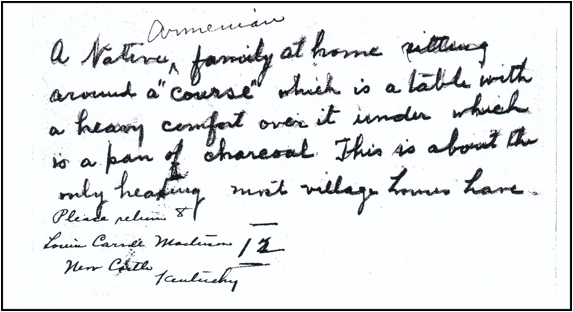 Ein Beitrag zur Culturgeschichte der Armenier.” [The Armenian farmhouse: a contribution to the cultural history of the Armenians] in Mitteilungen der Anthropologischen Gesellscahaft in Wien. New Series 12, pages 125-172 with 55 illustrations in the text. Endnote 4. 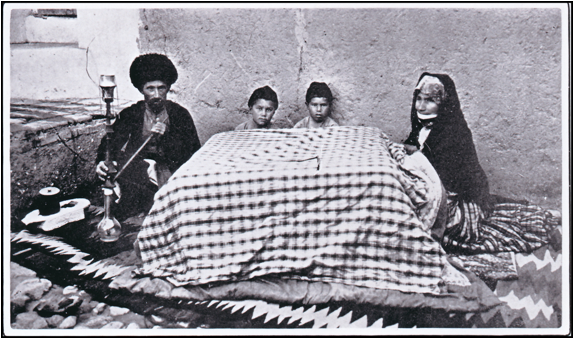 The ‘yorghan’ [Turkish for quilt although also referred to by village Armenians as yorghans as well, and/or as angorhin [or ungorhin] in Armenian. These were quilt-like comforters, usually of brightly colored cotton fabric –sometimes red, filled with wool and sewed with huge stitches of thread or string to keep the wool from ‘wandering’ within the coverlet and thereby yielding a heavyish comforter of unequaled cosiness. Unlike an eiderdown goose feather-filled comforter, which is infinitely lighter, the yorghan is not light in weight. The yorghan could serve either or both as mattress and coverlet blanket—the latter being referred to as a dzadzgots [blanket or covering]. Endnote 8. The spelling “kourss” adopted here is arbitrary, of course, since we have not seen the word printed in a dictionary. Our English spelling is based on well-recollected pronunciation. We leave it to others to find in a dictionary. In any case, as mentioned, the use of the kourss for warming the family inside the village home had been described the proverbial ‘hundred years ago’ in fairly specific terms to one of us (ADK) by his mother. appear in J. [Hagop] Michael Hagopian’s “Voices from the Lake” (Armenian Film Foundation 2000). 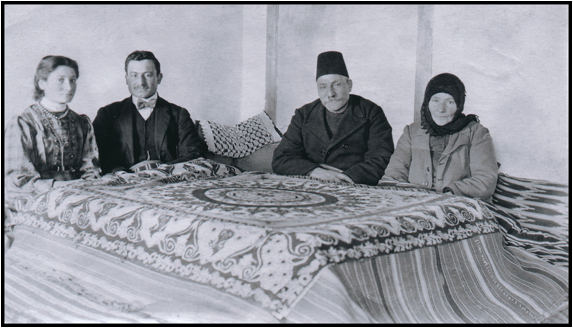 Mary Masterson told us that her mother had sent photographs to “some Armenian on the west coast” but could not recall who. Whether they were copied and returned or retained is unclear. No credit is given as to the source of some of the stills used by Hagopian. There is little doubt in our minds after careful consideration that some of the photos in “Voices from the Lake” derived from the Masterson’s camera. The “course” photograph shown here by us does not appear in the film. Endnote 10. The charcoal was used sparingly. Apparently on occasion some so-called komur [coal in Turkish]/adzough [in Armenian] would be used instead of charcoal. Some will be familiar with the expression of Kheljoo gragh Kharpertsi — a Kharpertsi who was poor to the point of having to use or build a very meagre fire — or as we have referred to it, as being “flaming poor”. In any case, one can be sure that the heating used was by no means exorbitant. After all, the villagers were necessarily very frugal. One figure we have seen that shocked even us is that around 1905, a peasant in eastern Turkey would make as wages the equivalent of about 12 cents a day! While we have been impressed and pleased over the years that many works have been scanned and made available to readers at no cost, the images are very bad – perhaps necessarily (?) bad. We started our work on ‘genocide-related photographs and imagery’ in earnest years ago. This was before such whole book scans were being thought of, much less made available in any quality- good or bad. Viewers will hopefully agree that a good quality scan from a volume in hand is not only considerably more attractive to look at but more useful for study than as a printout from a digitized relatively low-resolution version. Those who insist 300 dpi is sufficient do not know what they are talking about so far as we are concerned.